Quiet & Spaceous 4 bdr Mountain Chalet. Perfect for 2 - 3 Families. Welcome to our home -- Morrisey Chalet At Sun Peaks! This is a stunning mountain home in a quiet and private setting (yet still within a stroll to the Village at Sun Peaks). Our Chalet has beautiful mountain and forest views and a year-round babbling creek adjacent to the 4th hole fairway. Many families and friends tell us that they feel peaceful and relaxed in our mountain "home away from home" and we enjoy hosting families and/or friends coming together to create those special memories for summer or winter reunions. We have a floor to vaulted ceiling fireplace and panoramic windows, log beams, private 6 person hot tub, heated floors, leather furniture, large kitchen, four bedrooms, ample parking and laundry room. Our chalet sleeps up to 14 people, which normally includes eight adults and up to six children (including teenagers). 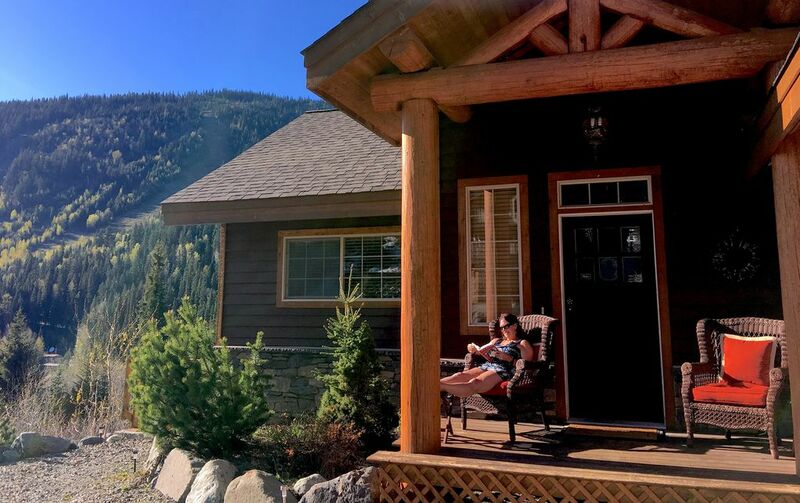 Morrisey Chalet has 4 bedrooms (1 master bedroom on the top floor with a queen size bed, single bed, and portable baby crib), 2 bedrooms on the main floor with queen size beds, and a double and single downstairs that sleeps 3. There are also two double sofa beds in the downstairs family recreation room which sleep four. All queen size beds have comforters/duvets and memory foam for comfort. There are three bathrooms with heated tile floors. The chalet is perfect for extended family reunions or TWO TO THREE FAMILIES to get together. Children and teenagers love our downstairs family and recreation room and the fact that they can sled right across the street on Mt. Morrisey (we have sleds available). PLEASE NOTE that we have a separate access unit below Morrisey Chalet with stairs down on the left. Kathy and I stay there full time in winter, so we look forward to meeting our guests and offering a personal service. We do, however, feel it is important to respect your privacy, since this is your holiday, and the entire large home and hot tub are used solely by you as guests who rent the chalet. SKI-IN ACCESS is from two of Sun Peaks’ newest Morrisey black runs: “Lint Trap” & “Tumble Dry” plus blue run "Back In Time," and green run “Home Run-Fairway-Mountain View" trail. Our guest book contains full description of the runs with map and photos. There is not a very easy ski out. Younger/fit people may climb up the hill across our street and ski down to the Burfield Chair, BUT a shuttle stops DIRECTLY in front of the chalet every hour during ski season (starting at 8:30am). The last shuttle leaves the Village Day Lodge (VDL) at 9:30pm, and starting winter, 2018, Sun Peaks will have a new taxi service. We enjoy taking the shuttle since it is easy and we find it much more convenient than driving (and is better for the Sun Peaks environment). PLEASE NOTE THAT PRICES on VRBO are in US DOLLARS unless specified otherwise. For Canadian dollars, please see: www.homeaway.ca/cottage-rental/p749332vb (the Canadian HomeAway site). You can book through either the VRBO or HomeAway sites for the same price. We have special reduced prices for week long stays, weeknights and summer periods. Sun Peaks has been experiencing a building boom and we currently have new home construction on our street including next to Morrisey Chalet -- but construction stops after 5:00pm and now is mostly on the inside of the house being built. We are located on Mountain View Drive, in Mountain View Estates, one of the newer subdivisions in Sun Peaks. Morrisey Chalet is a peaceful walk along the Village Trail (15 min) or along Fairways Drive to the Village Day Lodge (VDL), restaurants, and shops/businesses. Welcome to Morrisey Chalet at Sun Peaks! We are the owners of Morrisey Chalet as of July, 2015 and are working hard to make your experience at Morrisey Chalet - a home away from home in the mountains! Quiet and private location with amazing views up and down the valley and striking sunsets in spring, summer and fall. Listen to the year-round babbling creek from the large deck or hot tub. Wireless internet, cable TV and home phone for local calls. Hardwood flooring on main floor with a heated tile floors in the bathrooms. 23 ft vaulted ceiling in the living room featuring towering Douglas Fir columns to frame this one of a kind view. Spectacular floor to ceiling rock fireplace that you just need to flick a switch to heat yourselves and relax in front of after a great day on the slopes. Granite countertop in kitchen with a new Braun dishwasher, and fully outfitted kitchen (utensils, plates/cups/glasses, blender, coffee maker, etc) that you will need for your vacation. Extensive use of tile and slate throughout the chalet. Private upper master bedroom with ensuite bathroom and large walk-in closet. The master bedroom is perfect for a couple with a baby or young child (including a movable toddler play pen). We also have a high chair available in the garage. There is a versatile FAMILY/REC ROOM downstairs that has a card table and numerous folding chairs, lots of books, CDs, DVDs plus a flat screen TV with attached DVD player and two very nice double sofa beds. This room is great for games, entertainment, and for the kids to enjoy their own area. It is adjacent to the fourth bedroom with a double bed below and single bed above, and an adjacent well equipped bathroom with a heated tile floor. 2 new (2018) flat screen TV's (living area and lower rec/family room) & DVD player attached to one of the TV's (lower rec/family room). Extensive selection of DVDs available. Well appointed bedrooms with warm duvets, closets, and dressers for your belongings. A expansive and private back deck for your relaxing and viewing enjoyment, adjacent to the Sun Peaks golf course and provides views of the ski slopes and mountains up and down the valley. Gas BBQ with side burner located on the back deck where you can watch skiers descend (or enjoy the three season babbling brook) as you grill. The walls of Morrisey Chalet at Sun Peaks have been recently adorned with original photographs (on canvas) of the Sun Peaks environment. These are available for purchase from the owner. Ample parking for up to 4-5 vehicles outside and one slot inside the garage is available. NO PARKING ON THE ROAD in winter. The snow plows need to get through. If one parks on the road in winter, this will result in a fine from the bi-law officers. Private laundry facilities on site with nice stacked washer & dryer. Private 6 person hot tub which is kept cozy undercover and overlooks the forest with sounds of the year round creek. We also have an automatic green light that brings the trees alive during the evening. Ample storage for skis and boards both inside the garage. This is not a party house, nor do we rent out for weddings, stag parties, etc. We encourage regular family get-togethers, and want you to have fun, but we do have neighbors with small children, and expect our guests to respect their right for quiet after 11pm (as the Sun Peaks Bi-laws state). CHILDREN: We have flexibility in the master suite with an extra single bed, plus a portable toddler floor crib and an extra foam pad (on request). We also have a high chair. In addition we have many DVDs for children plus many board games. PETS: We will consider pets (please describe your situation regarding your pet). There will be a pet fee per pet (with a maximum of two pets). We believe Sun Peaks and our location at Mountain View Estates offers the great balance in being a part of such an amazing new community (the Municipality and Village of Sun Peaks). This is one of the friendliest places we have ever lived and it has such a great balance of just the right weather and temperature in summer (an escape away from the heat elsewhere), and the most consistent winter weather we have experienced at a ski resort. With temperatures just right to keep the snow crisp yet not too cold for Canada to enjoy each day, Sun Peaks has amazing snow conditions. The grooming is second to none and with 137 runs and three mountains, all accessible to each other, this makes for real choice based on weather, finding that perfect powder run, or just enjoying the ample sunshine we experience during the season. We have often said "a bad day here is a good day somewhere else." Really there are seldom any bad days and you can virtually always find that special run - and hardly any lift lines! We have skied all over North America as well as Europe, New Zealand and Australia, and for consistency of snow conditions, Sun Peaks can't be beat! With the most consistent winter weather we have experienced at a ski resort, now it is Canada's second largest ski resort and in the top 5 or 6 in North America in terms of skiable acreage (close to 4300 acres) with 137 runs including 16 powder glades and close to 3000 ft vertical. In the spring, summer and fall, there is much to choose from regarding outdoor activities, events and festivals, markets and music and being an active part of this mountain village experience. A number of lakes are within a ten minute drive and there are numerous walking and mountain bike trails (both cross country and accessible through the Sun Peaks lift system). Please also check out our "Photo Gallery" on this site to see additional photos and our location. We would love to have you and your family as our guests. Having a fully outfitted house for a group of family and/or friends in a private yet close setting. Especially great for families and groups of friends who would like to share their experiences in one very comfortable place. Our winters and our springs/summers/falls are amazing here: just the right temperature and climate for each... Both winters and springs/summers/falls are filled with experiences for many interests. I (Harold) volunteer as a Mountain Host at Sun Peaks (meet at 9:15am or 1pm every day of the ski season just outside of the SP Village Day Lodge) and in showing many international and Canadian guests around our three diverse Sun Peaks mountains, I often hear comments like: "amazing snow conditions," "friendliest community," "we feel like this is our home away from home," "everything is here for us," "great weather," "no lift lines," "all connected," "great alternative to Whistler," and many other positive comments. Sun Peaks feels in some sense like a small mountain boutique resort, yet it's facilities and mountains are world class and some of the top in North America. You feel away from it all, yet right in the heart of the experience. Sun Peaks is not spread out like other resort areas and the people who both live and visit really cherish their place. The integrated partnership of the mountain operation (Sun Peaks Corp.), the municipality (Sun Peaks Municipality), the visitor services (Sun Peaks Tourism), the many dynamic business owners and the village residents is unique and inspiring. And they are all focussing on one key aspect: "It is all about the EXPERIENCE!" Please also check out our "Photo Gallery" on this site to see additional photos and our location. We would love to have you and your family as our guests. Click 'Reserve Now' to secure your preferred dates. Please ask if we can accommodate your travel dates. toilet, combination tub/shower, Full bath/shower combination and heated tile floor. toilet, combination tub/shower, Large bathroom with heating tile floors & full bath/shower. The resort village of Sun Peaks is most certainly a highlight of any stay at Sun Peaks. Many restaurants and meeting places for all to enjoy. Just a stroll away or a very short drive and free parking. Enjoy the 15 minute stroll on beautiful green space pathways (lit up at night) along the SP golf course and walking by a beautiful small lake to the Village of Sun Peaks. Two beautiful lakes are located within less than a ten minute drive. Great for fishing and kayaking/canoeing or paddle boarding. Small year round babbling creek flows below the property. Located adjacent to the fourth fairway of Sun Peaks Golf Course. We have views to the Burfield Chair runs and to Sundance Mountain runs as well as expansive and diverse mountain trees in a very private setting. Enjoy sunsets down the valley from our private deck. SKI-IN ACCESS off two of Sun Peaks’ amazing and newest runs: "Tumble Dry" & "Lint Trap". You can also access Morrisey Chalet from two other runs: "Back In Time" & the green run “Fairways/Home Run". SKI-OUT ACCESS is a vigorous walk up a hill to ski down on the trail to the Burfield Chair. Or alternatively the free shuttle picks up right by the chalet (every day from 8:30am - 9:30pm every 40 min. We have a small babbling creek which runs year round - you can hear it from our deck or while enjoying our private hot tub. No air conditioning, but the cool mountain air means it is seldom hot in the summer months. We have up to three large fans available in case there is interest. Tile floor heating in all bathrooms. Electric panel heating throughout house. Large capacity washer and dryer (2016). With detergent provided. New and large capacity washer and dryer (2016). Floor to ceiling rock gas fireplace. Ample off street parking for up to four to five vehicles. Room for one extra vehicle in the garage. Please no street parking based on Sun Peaks bi-law. Available on request for one vehicle. We have ample storage for ski and board equipment. Complimentary free wifi available on site. All towels are provide with the exception of larger towels (if of interest) for the 6 person hot tub. Magnificent Great Room with 23 ft vaulted ceiling in the living room featuring towering Douglas Fir columns to frame this one of a kind view. New dishwasher (2018) and Includes dishwasher tablets. Three types of coffee makers including French Press and new Drip Coffee maker. Some basic pantry provided, including items such as: whole set of spices, also baking powder/soda, sugar, some coffee, oil and other miscellaneous items. Very well equipped kitchen with virtually everything needed for a feast or small gathering. The dining room is set up for flexibility with a large expandable table, 8 chairs & 6 extra folding chairs for large groups to all sit together. There are also kitchen bar stools. Two new (2018) flat screan TVs. One in the living room and a smaller one in the rec/family room. The one in the rec/family room has an attached DVD player. Music can be played by Bluetooth through the new flat screen TV and sound bar in the living room. DVD player attached to the flat screen TV in the rec/family room. A large selection of books available. We have a large selection of board games. We have a large number of board games and puzzles. Large and diverse selection of CDs. Ample and diverse selection of DVDs available with Morrisey Chalet. Overlooks small lawn and natural garden outlook. Large deck overlooking the amazing mountain and tree views. In Summer, this includes outdoor table and chairs (as well as large umbrella). Also includes bar table and chairs to enjoy the morning sun. A number of pristine lakes are located within a few kilometres. Available for rent in the Sun Peaks Village (trail and downhill mountain bikes). Boating is accessible at a number of beautiful nearby lakes. Choose from wilderness lakes or more active lakes. Large expansive deck with table and new umbrella (2018) available during spring, summer and fall stays. Also included is a new (2017) outdoor bar table and chairs to capture the morning sun. Ski-in to Morrisey Chalet from a choice of three runs off Mt Morrisey including the exciting newest runs of "Tumble Dry" as well as "Back in Time" and the easy return green "Home Run" a block away. Tennis nearby in Sun Peaks Village. We have tennis rackets available on request. Morrisey Chalet is located adjacent to the fourth fairway of the beautiful Sun Peaks golf course. There is a beautiful communal pool available in the summer within the Sun Peaks Village. Private covered and well maintained hot tub for six people available for guests at Morrisey Chalet. Hanger for towels next to the hot tub. ON AIR CONDITIONING. Though Morrisey Chalet is not fitted with air conditioning, our summers are quite mild with high temperatures seldom above 25C (77F) and due to the fresh mountain air, it cools down quickly in the early evening. We also have available large fans (and small fans on request) which can assist you in the odd day when it is a bit warmer. These are located in the MC entry closet for your use. It is often close to the perfect enjoyable temperature at Sun Peaks in the months of June through September. LAKES NEARBY. In addition there are a number of lakes nearby which offer amazing experiences for kayaking/canoeing/stand-up surfboarding, picnicking, fishing, swimming or just hanging out. Our favourites include Heffley Lake, McGillivray Lake & Paul Lake. FULL HOUSEKEEPING SERVICE is completed after your departure. Light housekeeping during your stay is appreciated. Garbage service is provided at the end of your stay to take care of the rubbish and recycling within reason. Somehow I miscalculated and thought we had a bedroom for all couples, plus the bunk room. But, no, one family had the playroom at the foot of the stairs! Fortunately we wore ourselves out so thoroughly that everyone seemed to sleep well no matter where they were! But the house was a bit tight for 15. The kitchen was well equipped and we fed ourselves well. Didn't have time to play many games, but there is a good supply of DVDs also. The front porch is a bit slippery...could use some textured paint or such. All in all, a very nice place! This home suited our group of 13 perfectly. The location is great and it is such a bonus to be able to have our dogs there as well! Thanks, Chris for the lovely review. We so enjoyed having you and your guests here. Thank you for respecting our chalet rules and leaving our place so nice and tidy. It was a pleasure to have you here. We certainly hope that you are able to return and stay with us. A beautiful home in a beautiful location. Our group was travelling to Kamloops to compete in a youth soccer tournament. We booked this chalet in hopes that it would become a vacation as well as a sporting event. It met and exceeded all of our expectations. The home was beautiful and well stocked with anything you can possibly imagine you need. The owner checked in with us to make sure that everything was available for our stay. We would highly recommend this home for any family or small group accommodations. Very nice house, a relaxing stay. The hosts are very responsive and helpful. The house was beautiful and accommodated all 15 of us (half were kids). Lovely hot tub and we really enjoyed the deck and bbq. Our group of 11 (3 families) stayed at this chalet over Easter weekend 2018. This was a ski reunion for our clan and other family members stayed at two other nearby chalets. "Ours" was the favourite and it was ideal for us to gather in the evening for après-ski. Nothing was missing. There are many extras - for example I made a split pea soup with the ham bones and was surprised to find a food processor and many spices in the well-stocked kitchen. It's not really ski-in, ski-out but the shuttle bus service is outstanding - door to door and very convenient. I would return in a heartbeat and would have no hesitation recommending this place. The owners are super friendly and extremely responsive and helpful with information. As one of our guests said in the following review, sledding is an additional activity: "Beautiful home, wonderful owners! We stayed here 6 nights over Christmas. Although we live in the area, we had a large blended family with grandchildren that we were hosting all at once for the first time! This home was roomy enough for all, extra cot and crib were provided, and it is close enough to the village that grown ups can enjoy a quick walk. There is a shuttle that stops right outnfront every half hour as well. Not to mention all the amenities provided in the house! Plenty of cutlery, and towels for the hot tub. Huge windows with views of the runs, and granite countertops even! The owners are what we felt was very special about this home. Not only did they set up a real Christmas tree for us, happily; but they also stopped in to introduce themselves with smiles, thanks us for shovelling the walkway, and to let us know a decent amount of happy kid noise was welcome by all means! They were always quick to reply by email or phone, and thankful when we mentioned a few minor things that could be upgraded (slow drip coffee maker). Oh, and it snowed every night and was sunny most days!! The skiing was incredible, as was the snowmobiling, and there happens to be a good toboggan hill just across the road! These are wonderfully kind people who share a big, beautiful home on a big beautiful mountain! Thank you H&K Enjoy!" LOWER RATES FOR LONGER STAYS: Be sure to check out our significantly lower rates for longer stays and weekdays. This includes: a discount of 10-15% off for 7 to 29 days (depending on the season); and a higher discount (close to 20% off) for 30 days or more! Rates are for up to 11 people. For more than 11, there is a $25/person fee per day. Note there are beds for 13 (14 with a toddler). Linen needs to be provided for over 13 people. Please discuss this with us if you have more than 13 people. Remember that we are not a party chalet, however we do appreciate that Sun Peaks is a holiday/vacation destination so we want you to fully and responsibly enjoy your stay. Please see the rates for more detail. For assistance please email us at morriseychalet@yahoo.com. RESERVATION POLICY: 50% deposit due upon booking. Balance due 60 days prior to arrival. We recommend that you obtain trip insurance in cover yourself in case you need to cancel your trip for any reason. DAMAGE DEPOSIT: A credit for $500 is due before your arrival as a deposit against damage to the chalet, missing items, and/or excessive cleaning charges. Deposit will be refunded within 4-7 days of stay. Note, well behaved pets are considered and normally incur a $25/day extra fee per pet (minimum of $90, possibly discounted for longer stays). STAY IN SUITE WITH SEPARATE ENTRANCE: From time to time the owner's suite is occupied. Though they may be on site during your stay, feel free to enjoy Morrisey Chalet with your friends and family. Also, they park in the separate parking bay to the left looking toward the street. SNOW BLOWING: During your stay you may see someone onsite either snow blowing or shovelling. We make efforts to keep the driveway clear of new snow, however sometimes you may see a snow berm along the front of the driveway from the large external street snow plow. Twice a day during snow periods our extra snow clearing crew may be by to clear the berm if it is quite high.